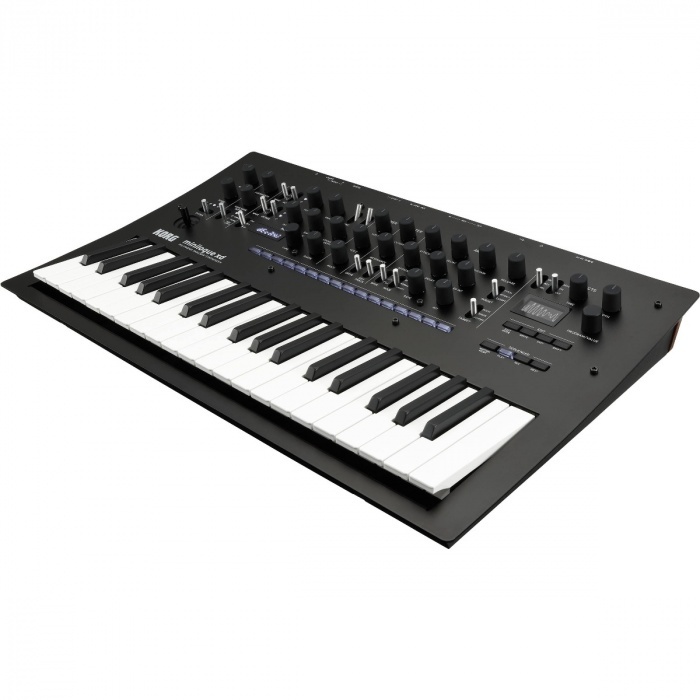 The 4-voice Korg Minilogue XD is Korg's latest polyphonic analog synthesizer that builds upon the success of the Minilogue, Monologue, and Prologue synthesizers and harnesses the most sought after features of each, culminating in one of the most advanced instruments available. By combining multivoice, multitimbre, and Multi Engine technology, the Minilogue XD utilizes a best of feature set from each 'logue product with additional features including a digital multi-engine, digital effects, a feature-rich sequencer, and microtuning, which further expands the possibilities for sound design and performance. The synthesizer's architecture uses two VCOs + multi-engine (VCO3), a 12 dB/octave filter, two envelopes, a VCA, and an LFO. The multi-engine is equipped with three sound generation devices including a noise generator, a variable phase modulation (VMP/FM) generator, and a user oscillator, which allows you to load your own oscillator programs including custom wavetables via a free editor/librarian. The two-pole, low-pass filter with enhanced sharpness adds drive with powerful distortion, as well as a key-track switch. Its sound covers almost every sonic possibility: fat basses, powerful leads, and the lush pads that you expect from a polyphonic synthesizer. Additional features include four voice modes, a powerful arpeggiator, a 16-step sequencer with step, real-time, & motion recording, and a 32-bit digital effects engine, which provides three simultaneous effects including modulation, reverb, and delay. The 37-note slim-key keyboard and assignable joystick provide remarkable touch and feel for inspired performances, while the OLED oscilloscope provides visual feedback of parameter changes in real-time.